Long-stemmed cherries wrapped in caramel and Swiss chocolate. OMG! These sweet, long-stemmed cherries are wrapped in caramel and Dorothy's pure Swiss chocolate. A small gift with a big impact. 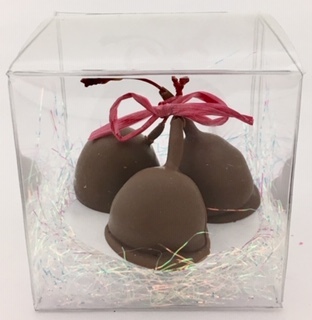 The three long-stem cherries are tied with a bow, and nestled in a clear box. Beautiful sight-- unparalleled deliciousness! That's why we call them OMG's.